Non-Wii-owners hoping to get their hands on Warren Spector's reimagination of Mickey Mouse are out of luck: Despite rumors, the "Epic Mickey" project is a Wii exclusive after all. 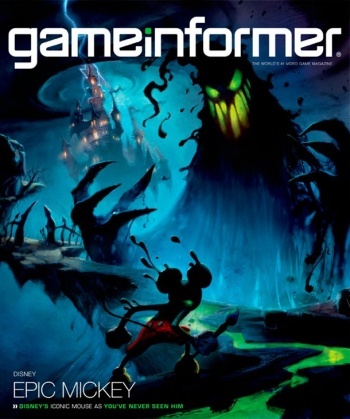 Yesterday, we reported that sharp-eyed gamers had noticed that the text describing the "Epic Mickey" project as a Wii exclusive had quietly disappeared from the Game Informer landing page, leading to speculation that the title might be headed to other platforms as well. As it turns out... nope. The text had been pulled, but it hadn't been done to hint at the game's platform of choice. Rather, the GI staff had been hoping to formally announce that tidbit of news once the actual issue hit stands this Monday, explained Andy McNamara. The revelation that Oswald the Lucky Rabbit is on the cover artwork dovetails nicely with the leaked information, and McNamara teased an "amazing" update to the landing page to come tomorrow.